For Doors ………….……… 1 ¾” thick standard optional 2 ¼” thick. 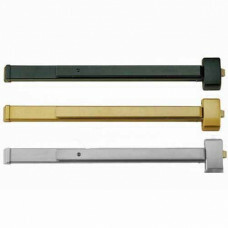 4 ½” minimum stile width required for single or double door application using standard 239 strike and pull or lever trims. Mounting…………………… Furnished standard with wood and machine screws. -Available with thru bolts on request. Electronic Functions......... (ELR) Electrical Latch Retraction and RX & LX Signal Switch available. - UL Listed for Panic and UL10C, UBC 7-2-1997 codes. - Conforms & Meets ADA Regulations. - (A) label rating on pairs of doors up to 8' x 8' swinging in same or opposite directions. - Uncompromising security and safety in single and double fire exit doors. - Chassis mounted unit construction. - Available in many different functions. 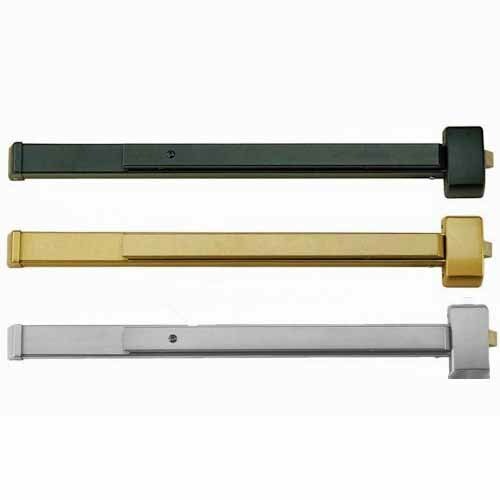 Lever and escutcheon trims are Grade 1 construction with clutch on rose trims. Escutcheon trim are rigid and covers 161 cut out. 12-2828-F Sargent UL Fire Label Rim Exit Device - Less Trim 36"
The Sargent 12-2828-F is a UL Fire Label Rim Exit Device less trim 36” for doors 33” through 36”.&nb..